Question: When do you use i.e., and when do you use e.g., and what do they mean? Answer: The Latin abbreviations "i.e." and "e.g." come up very frequently in writing and would probably come up more often if people were more sure of when it is right to use "i.e." and when "e.g." is required. To me, the only way to figure it out is to know what they stand for. "E.g." means "for example" and comes from the Latin expression exempli gratia, "for the sake of an example," with the noun exemplum in the genitive to go with gratia in the ablative . "E.g." is used in expressions similar to "including," when you are not intending to list everything that is being discussed. I.e. and e.g. are such common Latin abbreviations that they do not require italicization. This is a picture they have up in the mens' room at my current client. 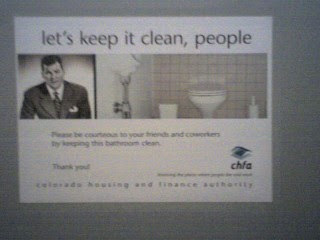 If you cannot read it, here is what it says: "let's keep it clean, people"
"Please be courteous to your friends and coworkers by keeping this bathroom clean." I wonder who decided we were such slobs that we needed such a sign. I also wonder if this considered that we the men's room users might get offended by the implication that we are such slobs.